This time with sick Aeron Alfrey art! Trampling Charge. 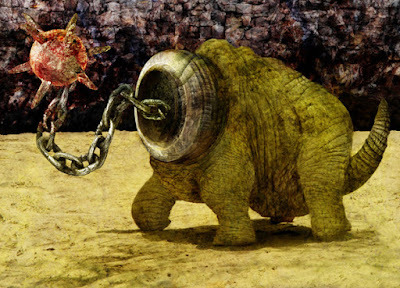 If the flailceratops moves at least 20 feet straight toward a creature and then hits it with a flail head attack on the same turn, that target must succeed on a DC 15 Strength saving throw or be knocked prone. If the target is prone, the flailceratops can make one stomp attack against it as a bonus action. Multiattack. The flailceratops either makes three flail head attacks against any targets of its choosing, or a stomp and a tail attack against different targets. Flail Head. Melee Weapon Attack: +9 to hit, reach 10 ft., one creature. Hit: 25 (3d12+6) bludgeoning damage. Stomp. Melee Weapon Attack: +9 to hit, reach 10 ft., one creature. Hit: 22 (3d10+6) bludgeoning damage. The target must make a DC 15 Strength saving throw or be knocked prone. Tail. Melee Weapon Attack: +9 to hit, reach 10 ft., one creature. Hit: 19 (3d8+6) bludgeoning damage.